Over the course of the 19th century, Austria prospered and especially in the second half, the "Gründerzeit" or "founder′s age", a wealthy upper-middle class developed in between common people and nobility. This new aristocracy gave rise to several social phenomena: The urge for representation, for example; politically by demanding a parliament, economically by showing off your wealth through pompous villas (just go for a walk in Vienna and look for houses from the Gründerzeit and you will know what I mean). Another development was tourism: The new aristocracy found Vienna stuffy, hot and humid in summer (because it is, essentially) and withdrew to nicer places in Carinthia, the Alps of Tyrol or Salzburg, or the Salzkammergut. This kind of vacation could last several weeks, especially if spent in your own countryside retreat, and was called a "Sommerfrische". Another development of this prospering age was a novel concept of German nationhood, fuelled by ideas of the Romantic period. This concept usually excluded Jews, a group of people who had only been assimilated slowly since the age of Austrian enlightenment in the late 18th century. They now became the target of increasing Anti-Semitism. It is quite obvious to look at the two social phenomena of the developing tourism and anti-Semitism and see if they overlap at some points. After all, it was often Jewish Austrians who were wealthy enough to go on vacation, since well-paid professions of this time such as medicine, publishing or finance jobs employed many (until 1866, the professions Jews were allowed to choose were legally limited to some areas). "Wherever you spit, nothing but Jews. All Sommerfrischen, spas and winter spa towns, there′s flocks of Jews everywhere!" was a complaint raised by the member of parliament and Catholic priest Joseph Scheicher in 1900. This statement marks the attitude of what was later called "Spa anti-Semitism". 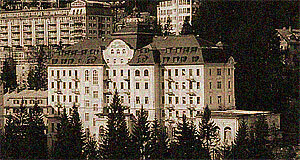 In Austria, spa towns had developed faster than in most other places in Europe and many of them were worried to lose customers if they gained a reputation for being a "Jewish place". According to an article by Josef Schorn, published in the Salzburger Nachrichten in June 2008, one of the most active anti-Semitic spa towns was Kitzbühel. Like no other Tyrolean town, Kitzbühel lives of tourism and its exceptionally rich inhabitants / visitors - which applies to the town today even more than it did a century ago. Funny enough, in 2007, a member of the local board of tourism raised the idea to release a quota for Russian guests. She pointed out that Russians tend to drink a low, be rowdy and generally disgusting new money. Whilst she might well be right with that in principle, it caused quite a response in Tyrol - especially by Kitzbühel′s competitors, like the "nouveau-rich" capital Ischgl: Russians, do come along, you are welcome to spend your hard-earned mafia money in Ischgl if Kitzbühel doesn′t want it! In fact, the Ischgl approach to Russians is easily as clumsily racist as Kitzbühel′s, but it seems to work: Every January, the town is full with the "worst of" the newly emerged upper class of Moscow. Continue with "Anti-Semitism in Austrian Spa Towns - Part II"